The Twin Air-Air Filter is designed with high quality materials and superior construction that delivers unbeatable performance and protection and will make the Twin Air- Air Filter the hands down choice of more world & national champions than all other filters combined. The Twin Air-Air Filter has two layers of foam the first layer of foam is open pore foam that catches airborne dirt, grime and sand and the second layer of foam traps the smallest of particles while ensuring maximum air passage. The Twin Air- Air Filter will give you the performance and durability that you want your machine to have during all types of conditions you will take it through. Twin air dual stage filters are the choice of top factory teams and riders worldwide. Dual bonded foam design filters out even the smallest dirt particles, while allowing more air flow than "two separate layer" filters (flow bench proven). Twin air filters are slightly smaller than stock, making them easier to change while increasing dead air space around the filter for better performance. Works great, easy install, used maxxima filter oil. It was between this filter and the No Toil. Good filters. Always fit. I never find dirt on the inside of the filter or intake. I like to have a couple extra filters ready to go so I can rotate them. I really like twin air but then I use no toil to clean. The twin air are great filters. Very good quality air filter and will take care if you if you take care of it. Keep your air filters clean. They are a wearable item and they need to be replaced. I love to have a few of these on hand and it makes switching them out easier. I have used twin air filters for many years now with no issues. Ever since I got this filter my bike runs way better! I have ran this product for several years now on my YZ450F. I also have them on my boys YZ65 and KX85 2018 models and have never had any issues. They clean easily and do the job every time all around durable great product. My most preferred air filter. Should come in RM colors or different colors in general. Good filter. fits good and cleaning is easy with hot water and dish soap. I ordered a spare air filter to have ready so that I don't have to clean/oil the dirty filter after a ride. It gives me time to do all the necessary clean-up work a bit later. Highly recommended. I have only used 2 different brands other than these and every time I take them out to clean, no dust getting by. Even though the picture is generic the filter was exactly what I needed and was a perfect fit. I was in a time crunch, but it shipped quickly and arrived before I was out of time. Haven't had it in my machine for very long, but it should last a long time. Quality, price, and fitment are all top notch! Easy to clean and reassemble is a breeze. Highly recommend! 2019 YZ450f First Must Have! I HIGHLY recommend this filter over stock,twin air has foam ends that over hang beyond the cage for a better seal,thicker foam for increased filtration,also comes with a spacer to hold and keep the filter from slapping against the backfire screen like the stock one does. 2019 Yamaha YZ450f stock air box with twin air element. With a twin air and good filter oil put on very liberally you should never see dust stains on the inside of the filter. Simply a great product. Works very well and lasts forever if cleaned correctly. I haven’t got to use it yet, but so far the quality is good air flows through great, still rebuilding my dirt bike so i have not been able to take it for a ride and check my intake after use. 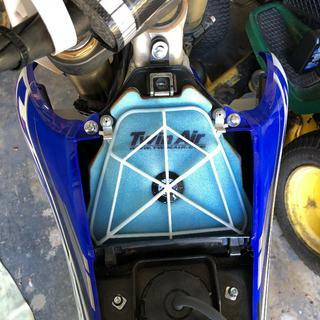 This a must have for the new Yamaha's, the stock filter doesn't have enough overlap at the back section and can leak air/dirt if it is not seated perfectly. The Twin Air filter has additional material in this area that solves this issue. Good fit for every bike I have ever put them on. Even a xr400r that I bought a uni for (returned) Never a spec of dirt in an air boot with Twin Air. I've used Twin Air filters for 7 years now and they have never let me down. Wash with gas, rinse with soap and water and they come clean. Very durable. Usually alternate between 2 of these filters for 20 to 25 engine hours, then I replace them for preventative maintenance purposes. Twin air is Twin Air. They are the best! Fits perfect and the foam is thick and durable. Works great, keeps the honda rubicon running smooth. Its expensive foam but you gotta have it what can i say. Is it any better than Tusk? I have no idea but will find out when i replace this one. As long as you don't use gasoline to clean the filters they last and clean up perfectly. Every bike I own has TwinAir filters. Some are 6+ years old now and no signs of decay or failure. Use the TwinAir cleaner. Can't go wrong with a TwinAir filter, Keep's the dirt out, and is always a perfect fit. The BEST Air-Filter bar none! Years ago, I used Uni filters. When I switched to Twin-Air the cleaning process was far easier and the fitting on the air-filter frame/sealing was superior. good to put on good to fit good seal you cant get enough clean air right priced right Keeps my Husey thomping away. Great product. All I've ever used! Great fit, great upgrade over stock. Fits nice. Every time I remove my Twin Air filter for cleaning the air box carb canal (or whatever you call it) is spotless. I have used these air filters for years and will continue to do so. Great Filter a little pricey for a 15 dollar filter that is the size of my palm but the stock filter that was on it lasted for 10 years. So Im hoping this would last as long. Excellent performance and value. The only filters I use on my two stroke. I had a uni filter first and i like this filte much better. are those beer holders that come w/the air filter? BEST ANSWER: Unfortunately, those are not beer holders. That is just a generic picture showing the different air filters that Twin Air makes. BEST ANSWER: We do carry the Power Flow replacement filters, however, we do not have a listing for your application. I apologize. Does this come with everything shown? or just what your bike needs? BEST ANSWER: The picture is a generic. You will receive just one air filter that will fit your machine. does it come with stickers and how many? BEST ANSWER: yes, two twin air stickers, so buy these two stickers and you get a free air filter! Two stickers in my package. I like having a few of these filters ready on hand. It did! Unfortunately, there were only two. Happy filtering! Does this come with the plastic holder ? No it comes as the foam filter. You need to purchase the plastic skeleton separately. No, just the filter itself. You would have to purchase a "kit". No just the air filter it self. Does it come pre-oiled ? No, but they do sell a pre oiled option. No, you will need to oil it. Does this come with a cage for on a xr650 2016? BEST ANSWER: Not sure about this particular bike, but typically, the cage would be sold seperstley, for all afternarket filters. No it will not come with a cage, you would use the factory cage, or order it seperatly. For my YZ250F the cage was sold separately, it is just the filter. BEST ANSWER: These are not oiled / google how no big deal /I am using twin air bio— dont forget your waterproof grease to seal the flange to the plastic. Mine was not preoiled but you can order them oiled. BEST ANSWER: No rubber O ring! Filter is exactly like the filter that came stock on my 300 KTM. No, at least mine doesn’t it is just as shown in the picture. Can I reuse the cage from a uni filter? BEST ANSWER: yes you should be able to re use the cage, as long as it is in decent shape and still holds the airfilter in place. I assume this is the stock cage. All filters are designed to work with the stock cage. do you sell the filter cage for this filter also? I don't have the original cage. it didn't com with the quad when I bought it. Does a YZ 450F 2018 air filter fit a YZ 250F 2019? BEST ANSWER: Yes, that will work. They have the same air filter. I have the new 2018 yz450f but i do not see the triangle filter for my bike? Is there not a picture or does twin air not make one? Are the filters the same for a 08 Honda CRF230L and CRF230F, from twin air ? Thanks. BEST ANSWER: I checked into this and the CRF230L and the CRF230F have different air filters. HI! Is this the air filter for the 2007 KTM MINI ADVENTURE?